Discussions Magazine Music Blog: CYPRESS HILL sign with PRIORITY RECORDS/EMI! CYPRESS HILL sign with PRIORITY RECORDS/EMI! Los Angeles, CA (January 15, 2010) – Legendary hip-hop/rock group CYPRESS HILL have signed an exclusive worldwide deal with Priority/EMI and are gearing up for the April 6th release of RISE UP, their first new studio album in six years. The deal is the first artist signing by Priority Records Creative Chairman Snoop Dogg. "My role as Creative Chairman of Priority Records has put me in the driver's seat to help revive the most important west coast hip hop label,” says Snoop. “As such, I'm excited to announce my first signing as Cypress Hill. Cypress Hill is undeniably one of the most important hip hop groups in music history, not only are they incredibly talented and the first Latino hip hop group to go platinum, they are also from the west coast—so this signing is the perfect marriage." "We’re very excited to be part of the Priority Records family,” says B-Real. “It's a label with a rich history, and together with Snoop we're going to add to its legacy." "It was great to work with my longtime friends and comrades Cypress Hill on these two monster rock tracks,” says Morello. “Cypress are back with a vengeance!" 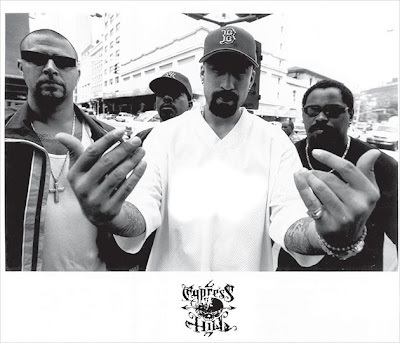 Cypress Hill (rappers B-Real and Sen Dog, DJ Muggs and percussionist Eric Bobo), is one of the most successful and influential hip-hop/rock groups in music history, with more than 18 million worldwide sales, an amazing string of chart-topping hits and an international fanbase whose members number in the millions. They’ve headlined Lollapalooza, been named “Best Rap Group” by Rolling Stone, collaborated with the likes of Pearl Jam and Sonic Youth, hit No. 1 on the Billboard Top 200 Albums Chart and have had their music licensed for a plethora of TV shows, commercials and films.